This time also, he is supported in this onerous duty by capable, load-bearing enlightened eminences from the local lands. Earlier it fell upon the noble Gardiner Harris to bear this burden, and his encyclical to the Hindoo natives of India, among whom he deigned to reside and grace with his eminence for a brief period of time, warned them of the futility of wearing “thick black eyeliner to ward off the evil eye” as long as they continued to adhere to the barbaric practices prescribed in their “ancient Hindu texts“, in a manner of speaking (never mind the ignoramuses who argued to the contrary – Vamsee Juluri and yours truly being just two of them). The obvious inferiority of the natives of India is compounded by the false religion a majority of its denizens follow. 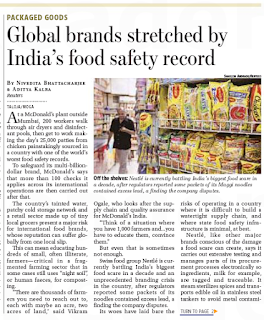 The latest installment of the unbearable load of this burden cries out to us in the form of the Reuters piece, front-paged in the business daily Mint on the 22nd of June, 2015 – Global brands like McDonald’s stretched by India’s food safety record. Penned by Nivedita Bhattacharjee and Aditya Kalra, it seeks to paint food giants like McDonald’s, Nestle, and others as noble corporations striving to bring healthy and modern conveniences to the natives, even in the face of insurmountable obstacles. Why? Why as in why does it need to go through those extra steps? 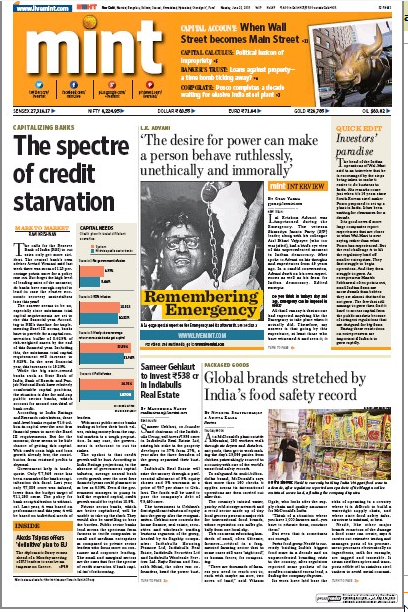 After all, what’s good for the world ought to be more than good for India. 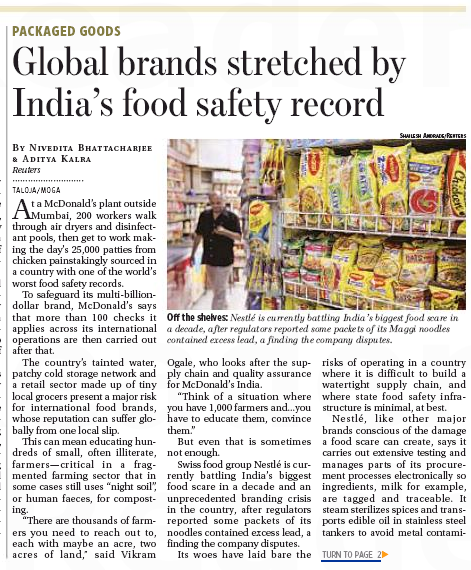 Because it operates in India, a country “with one of the world’s worst food safety records”, where it has to work with “small, often illiterate, farmers” – nay! not work, but “educate” these uneducated savages. The unending woe that is McDonald’s existence in India can be gauged, but never truly understood, till you also read that these farmers use “night soil”, or human faeces, for composting”! This burden of “educating” Indians means that till “about seven years ago” McDonald’s had to “import its french fries.” The Indians didn’t know how to even fry fries. The subtle irony of a nation of peasants being unaware of what it took to fry a fry would not be lost on many. And yet the ingrates that are Indians have the temerity to question the safety standards of the manna made by these benevolent benefactors! McDonald’s, Nestle, Wal-Mart, all have suffered for no other fault than a humble desire to uplift these natives from their hellish existence. The article would have been not out-of-place in a company’s press-release or in a paid advertisement. The portrayal of these giant multi-nationals as benevolent, caring, and flowing with the milk of human kindness would not have jarred there. 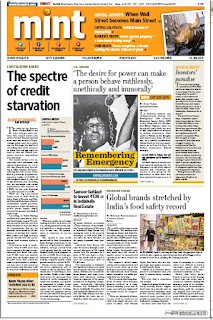 On the front-page of a respected business newspaper, it sacrifices any pretence of balance and objectivity. Why – one can only wonder. Most charitable explanation would be that it is a case of rank incompetence. Meanwhile, since we are talking about hygiene, the challenges of maintaining it (especially in a third-world country such as India where feces can be an issue), and the lack of a functioning regulatory and supervisory infrastructure, why don’t we take a closer look at the issue? (9) And of course, McDonald’s has a brand to worry about. It distributed “thousands of leaflets among tourists in the camp’s parking lot.” (these leaflets said, “Welcome to Dachau, and welcome to McDonald’s.” The tourists were at the Dachau concentration camp, which was – to refresh your memory – a Nazi concentration camp, and where 32000 prisoners were killed) Of course, McDonald’s worries about its brand, and one wonders, Reuters even more than McDonald’s. My piece on hygiene becoming the newest "white man's burden" was first published in Swarajya Mag on the 22nd of June, 2015.